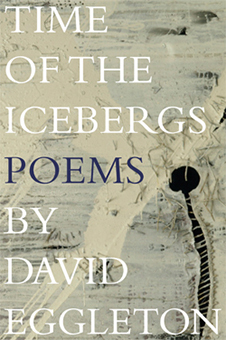 Time of the Icebergs, ISBN: 9781877578021 - available from Nationwide Book Distributors Ltd NZ. Much of Time of the Icebergs was written while David Eggleton was a Writer-in-Residence at the Michael King Writers Centre in Auckland in 2009. These are poems about the world we live in, tracing a dystopian present 'hurtling globalisation's highway' where 'Google tells Google that Google saves'. As he says, 'I think of it as a collection for browsing and discovering things: soundscapes, seascapes, landscapes, contemporary politics and contemporary people, histories, traditions, and other things besides.' In this time of winebars and infotainment, 'Ngati Cappucino and Ngati Bogan' stalk the streets bent beneath hoodies and 'boxy four-wheel-drives plane through the wet' piloted by 'yummy mummies'. Titles of poems reflect the absurdities of 21st century existence: 'Kate Winslet Promotes a Credit Card' riffs off an ad in the New Yorker, while 'Not for Human Consumption' and 'Twenty Second Century' hint at the ecological chaos of the modern world. Name-droppers, debt-dodgers, ghettoised gods and 'Vern Acular, that good keen bloke' all make an appearance, as does the lost five-cent coin. Poems set in Suva, Sydney, Christchurch, Auckland and Dunedin locate this book firmly in the South Pacific. Eggleton traverses the country: from Cantabrian landscapes of 'a geology sculpted into fists' and Dunedin 'tipped out of a colonial toy-box' to North Island summer idylls where you could 'follow a jiggle-string of beach pulled taut by the soaraway kite of blue sky'. Nationality and 'kiwiness' are under investigation. This is no mere intellectual exercise as through it all thrums the steady beat of life.